Active Colors wrote: Why is the theme creating window has the pixel number? If I am making my themes and skins adoptable to the screen size what is your offer here? It already starts to confuse users implying that themes can be created only for the fixed screen size. I don't want to see deviantart or forum full of same themes for different screen sizes. Yes! 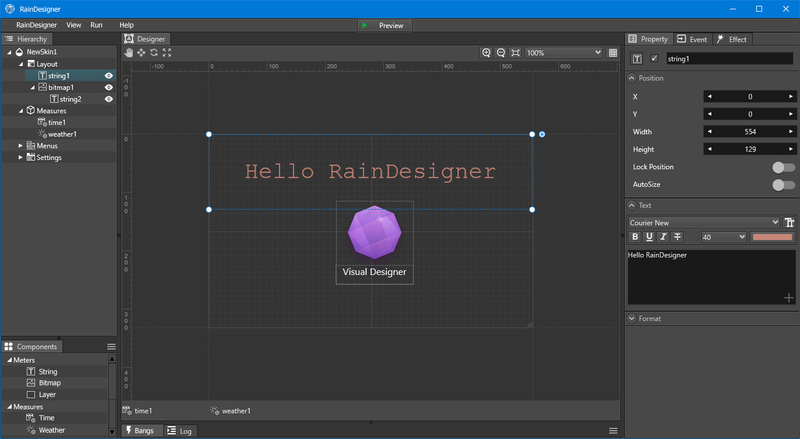 This is why I create the RainDesigner and also create another project RainmeterDesktop. My goal is that Theme author don't need care of the end users screen size, just create theme with one size, and the Theme will auto fit all of screen size of users. I have to tell you that I am skeptical to the point of hostility to this entire idea. While I understand and appreciate the intent, as Rainmeter can be a bit of a lift for a new user who wants to create or edit their own skins, this is almost certain to be something that I personally consider pointless and harmful to both our users and Rainmeter in general. While your time is yours to waste, that is exactly what will happen. You simply can't create a WYSIWYG interface for creating Rainmeter skins that isn't crap. It's not a matter of how clever a programmer you are, it's that Rainmeter is not paint-by-numbers. The entire idea of Rainmeter is that we provide you with a canvas and some paints, and you use them to create something that pleases you. Any tool that purports to allow users to just drag and drop measures and meters into a skin will by the nature of things at best allow for cookie-cutter creation of some standard skins. No matter how many options you provide for changing various attributes of measures and meters, you will simply never, ever, ever be able to even get in the ballpark of what is possible. The end-result is users who have learned nothing about how to really craft their own creations using Rainmeter. We will have sacrificed everything that makes Rainmeter what it is on the altar of "easy to use". You can play music with a Fender Stratocaster, and you can play music with a radio. It's hard to learn to play a guitar, and easy to turn on the radio. Of course, what you play on the radio is nice, but it's in no way "yours". Rainmeter is the Fender Stratocaster. We have no interest in it being the radio. As I mentioned you can't possibly get even close to all the ways the features and functionality of Rainmeter can be used to create skins. I don't know what the percentage is, but even if you get 80% of the way there, which you won't, that's terrible in my view. That just leave users in ignorance about all the other clever things they can do. Sure, they can figure it out on their own, as they have to do today, but they won't. The will be seduced by the idea that it can be easy to create Rainmeter skins, and never know what they are missing. This tool will ALWAYS be out-of-date. Rainmeter is changing all the time, we are constantly adding and improving on what you can do with it. Unless you intend to make a career out of maintaining this tool, it will pretty much always be missing some new functionality, or using some old out-of-date approach to something. You WILL grow tired of this effort, or have other priorities, and this tool will quickly and inevitably become a completely out-of-date orphan, that is of no use to anyone at all. Again, I understand and appreciate the idea behind this. However, it's not in the best interests of anybody. Not for "users", who don't need it, not for "authors", who won't want it, and not for the Rainmeter project or the Rainmeter community. I consider it harmful. We spend a great deal of effort making "using" Rainmeter as easy as we can, and are always open to new ideas. We spend a great deal of effort making "authoring" Rainmeter as powerful and flexible as we can, and are always open to new ideas. But make no mistake, efforts to reverse this, and make "authoring" easy, is a waste of time. There may be ways to add some help for authors. I could see a purely text editor that provides some helpful auto-complete features, or a way to highlight some keyword and pop-up some "help" of some kind, but I am absolutely certain that any kind of "skin creation tool" is a doomed, unwanted, unneeded, waste of time. The best help for skin authors is good documentation, good example skins, and helpful folks here on the forums. I'm always open to help with improving the first two, and certainly strongly encourage the last. This is my personal opinion, and I understand and accept that there will be those who disagree. I'm not trying to be disagreeable or unhelpful. On the contrary, I'm simply telling you that you are not the first person with this idea. There have been quite a few, and the result is ALWAYS the same. They come in with their hair on fire and full of piss and vinegar, post a few prototype screenshots, then get into the meat of it and realize that they have just taken on the Manhattan Project. That even if they do commit the enormous time and effort, it can never end up with anything that is actually of any use to skin authors. My intent is to warn you of that. I won't quote the entire post by JS Morley to say >> Well Said and I completely agree. Rainmeter should be better, at least it should be more popular than it is now, because we limit what it can do and what it can not do.This stop many new users to use it more easily. Without a reliable visual editor has also raised the threshold of create awesome Rainmeter skin . Rainmeter is not just for people who can write code, many designers have good-ideas but do not understand the code, and they have the right to use Rainmeter to create their own favorite skin. Do not impose your own opinions on others, just because you do not need it, do not represent the majority of others do not need it. You do not need a radio, but many people need it,and you also can not stop others need a radio. Of course, we had seen that Rainmeter's usability is keep improve. E.g at before the skin package were even zip-formatted and needed to be manually unzipped. Now that you have the ability to double-click the skin to auto install skins, this is a Great Iprovement,Very good user experience, and the visual editor does the same. I want to say is that DO NOT Limit ourselves,and DO NOT Limit Rainmeter, anything is possible,just keep going. jsmorley wrote: I have to tell you that I am skeptical to the point of hostility to this entire idea. While I understand and appreciate the intent, as Rainmeter can be a bit of a lift for a new user who wants to create or edit their own skins, this is almost certain to be something that I personally consider pointless and harmful to both our users and Rainmeter in general. While your time is yours to waste, that is exactly what will happen. nakamoto0 wrote: Rainmeter should be better, at least it should be more popular than it is now, because we limit what it can do and what it can not do.This stop many new users to use it more easily. I would actually be interested to see if the visual editor can create a very simple skin like this. It uses shapes, images, round lines, strings and several formulas. My code is only 159 lines including 21 blank lines for ease of reading and 2 different image files. Of course not, what you will get is 10,000 identical digital clocks, with different colors and a different font, and a different Anime character image. I think nakamoto has made my point. The idea here is not to provide a tool that helps authors create the kind of clever, beautiful, useful skins we see all the time, to give them a hand doing that, but simply to lower the bar in order to make Rainmeter "more popular". It's removing creativity, flexibility, and any sense of accomplishment, and simply creating a factory for stamping out cookie-cutter variants of the same few skins. It's the worst idea in the world. It's of no value, and helps nobody. Rainmeter has become "popular" because of what it is and what you can do with it. I am always eager to improve the ways you can be creative with it, and that may well add to more popularity. However, I'm in no way interested in making it into "paint-by-numbers" on the altar of popularity. There is a reason why using things like the Shape meter are complicated. It's not because we didn't take a lot of time and trouble to make it as logical and easy to understand as we could, we did. It's because the very idea of Rainmeter is to provide the kinds of tools that unleash your creativity, and the only way to make Shape any easier was to make it less capable. We will never, ever do that. It's not what Rainmeter is all about. I've said my piece and I see no reason to fight a protracted philosophical battle that has no right or wrong conclusion. Certainly everything I've said is strictly my opinion, and others may disagree. Doesn't matter really, this entire thing will never actually happen, it never does. You know why? Because it can't, and shouldn't, be done. nakamoto, I don't mean any of this as a personal attack on you. I understand entirely that your intentions are good. I understand the concept that "if we make this easier, it will be more accessible, and thus more popular". In my view however, you can only make it "easier" by sacrificing, or avoiding, everything that is good about Rainmeter. I'm perfectly fine with you, but I hate this entire idea like poison. You have to do what you have to do though, nobody here works for me. Of course we can do this with visual designer easily, I am sure. 3. Drag three String Meters to the design area, select the "Time" as their "Measure" and set their Text for the month, week, etc. click run, the skin on your desktop. finished. I have developed the 1,2,3.
the 4 is under development. This will be a very simple drag-and-drop operation and the skin author will be free to create his own skins without having to learn how to write the codes. My point is not that we can more easily create more such simple skins, My Point is that it allows skin author stop wasting time on this meaningless repetitive code work and instead focus on their own ideas and designs. Last edited by nakamoto0 on March 7th, 2018, 2:00 pm, edited 2 times in total. Thank you jsmorley, you are my respected developer,If without you there would be no such Great Rainmeter , but I hope to follow my heart to do something I like. and I do not want to discuss the Notepad and VisualStuido IDE which is better. I just follow my heart to do what I think right. jsmorley wrote: Of course not, what you will get is 10,000 identical digital clocks, with different colors and a different font, and a different Anime character image. Alright my turn to give my 2 cents and I think you all are overlooking a key thing here, what features do a WYSIWYG provide to a normal user? A normal user has no interest in doing anything more than simple modifications to skins they are not going to spend a large amount of time creating something from scratch, they are just gonna go download something that already looks cool and maybe edit some settings to their liking. A skin dev would quickly have no use for this as it would become a hassle to have to deal with as their skins will either become too interconnected for this to really work or it is just simply a glorified option setter. Or as jsmorley said something like ReSharper for Rainmeter skins that helps insert snippets and guide best practices without having to leave the text editor. 2. Powerful that someone can make really anything they want (And plenty of examples and already made plugins and scripts to prevent having to remake the wheel) with a good curve for being able to do more and more extreme things. 3. We can't make doing the complex very well easy but we can always be here to lend and hand to those who need it and I think we have a great community for this.